Guruji Shri Narendra Babu Sharmaji has started new section in his Bruhat Brahmanda programme called Ashtadasabhuja Durga Darshana. In which Guruji reveals the details on Lalitha Sahasranamam. Guruji have divided the Lalitha Sahasranamam into 18 sections, he plays each section and reveals the Goddess Durga Temple related to it. The First Temple in Ashtadasabhuja Durga Darshan is Kanaka Durga Temple, Vijayawada. The Lalitha Sahasranama verse played by Guruji, related to it are given below. Goddess Sri Kanaka Durga incornated herself [Swayambhu] on the hillock known as Indrakeeladri situated on the left banks of River Krishna at Vijayawada. The origin of this shrine is known from 8th Century. His Holiness Sri Sri Sri Sankara Bhagavatpadulu [Adi Sankaracharya] visited this temple during 8th century and worshipped the deity and installed "SRICHAKRAM" at the feet of Goddess. This temple is of Smartha Agama Sampradaya. Sub-temples of Lord Sri Malleswara swamyvaru, Sri Nataraja Swamy temple are located on North East corner of Goddess. Sri Subrahmanyeswara Swamy temple is located on North side of main temple. The temple was constructed during the Regime of Moghal rulers. According to Sthalapuranam, Moghal Ruler Thanisha with the assistance of his Ministers Akkanna and Madanna managed the temple with head quarters at Kondapalli. This temple is 2nd largest temple in the state and one of the popular pilgrimage centre, and has been acquiring importance day by day. In good olden days a Yaksha named 'KEELA' had been performing awful penance about holiest goddess Durga. Goddess Durga was pleased by his penance and appeared to him. She asked him to beg a boon. Keela was so happy by the words of goddess Durga and begged like this, "O holy Mother! you should always be in my heart. This is the one and only my desire". Listened goddess Durga and gave the boon with showering the lunar lights of smile and said, "My Son! You remain here at this holiest planes of river Krishna in the form of mountain. In Krithayuga, after the assassination of demons, I will remain in your heart". As such, by the order of goddess Durga, Keela had been waiting in the form of mountain for goddess Durga. After sometime, in the Krithayuga goddess Durga killed Mahishasura who was a disaster for World. Then goddess Durga shined on the Keela mountain with eight arms in the form of MAHISHASURA MARDINI as she had given boon to keela. On this mountain, goddess Durga had been glowing with the lighting of crores of suns, with golden colour. Since that, Indra and all the deities praised her chanting "KANAKA DURGA" and they had been worshipping her daily. This mountain has attained the name "INDRAKEELADRI" from those times, since all the deities are visiting this mountain. Likewise, since goddess Durga shined on this mountain with golden colour glowing, the name 'KANAKACHALA' also attained by this mountain. Holy Indrakeeladri mountain became holiest after prevailing goddess Durga on this. Then Brahma Deva had a sacred intution that Lord Siva also should prevail on this mountain. For this holy purpose, he had performed 'Sata Aswamedha Yaga'. By this, lord Maheswara pleased with his devotion and rested in the form of 'Jyothirlinga' on this mountain. By the first time, Brama Deva worshipped lord Siva with Jasmin flowers (Mallika) with great devotion. Since Lord Siva was worshipped with Jasmin flowers by Brahma Deva, he has attained the name. 'MALLIKESA'. After this, in Dwaparayuga Arjuna, middle one of the Pandavas, awfully penanced about Parameswara, seeking 'Pasupatastra'. Parameswara wanted to test Arjuna and fau,ght with him. Finally Lord Siva pleased with the devotion and dauntlessness of Arjuna and offered him Pasupatastra. From that day 'MALLIKESA'had attained the name 'MALLIKESWARA' since he faught with Arjuna with greatest bravery. Days were passing on and on. In Kaliyuga, Jagadguru Sri Adi Sankaracharya observed that the Malleswara Jyothirlinga was in bad invisible condition and he reÂ­installed Malleswara Swamy at the Northern Part to the temple of Goddess Durga. From that day onwards, Malleswara Swamy also has been worshiping by all the devotees. Since goddess Durga has been prevailing at the Southern direction to Lord Malleswara, this Indrakeeladri renowned in the World as power prominent centre the "KANAKA DURGA KSHETRA"
The temple of Kanaka Durga the Goddess of power, riches and benevolence and the presiding deity of Vijayawada, is swarmed by lakhs of pilgrims for worship during the "Navarathri" festival which is celebrated with Religious fervour, pomp and festivity. The small but ancient temple of Kanaka Durga , a top the Indrakeeladri hill on the banks of the Sacred river Krishna in Vijayawada abounds with legends of historical interest. Indrakeeladri is unique in that it has been the chosen abode of Kanaka Durga and Her consort Malleswara as Swayambhu (the self-existent one). Here Durga is one the right side of Malleswara as against the tradition of Goddesses taking their position on the left of their consorts. This shows that Shakthi is predominant on the Indrakeeladri. Legend has it that the demons acquired great powers by appeasing the Gods and began harassing the sages on the earth. Goddess Parvathi assumed various forms to kill these demons. It was kausiki to kill Sumbhu and Nisambhu, Mahisasura Mardini to kill Mahishasura and Durga to kill Durgamasura. "Kanaka Durga because she was aglow with golden hues, and prayed Her to stay on earth and bless them. Kanaka Durga asked Keeludu an ardent devotee to take the form of hill to enable Her stay on him. Thus Keeladri became the abode of Durga. She took the form of Mahisasura Mardini with eight arms holding different weapons, riding on a lion and trampling Mahishasura on the hill of Indrakeeladri. Her consort Shiva took his place on an adjacent hillrock as Jyothirlinga. He was worshipped by Lord Brahma with jasmines (Mallelu) whereby he got the name of Malleswara Swamy. As celestial beings like Indra visited the place, the hill came to be called Indrakeeladri. Here it was according to another legend, that Arjuna performed penance and fought with Lord Shiva, who had appeared in the guise of Kiratha to win pasupathastra, the most powerful weapon. So this place is also called phalguna theertha. Hiuan Tsang, a Chinese traveler wrote that he has seen many stone inscriptions in the vicinity of the temple that revealed historic events. Palakethu Bhupaludu made two inscriptions in the period 1150-1240 A.D. One related to unimpeaching Madhava Varma the ruler of this area. The son of poor women was killed when he fell under the wheels of the chariot of the kingâ€™s son. When she sought justice, Madhava Varma's advisers said that he should be punished with death. But they felt that the offender being the son of the king, could be spared the punishment. 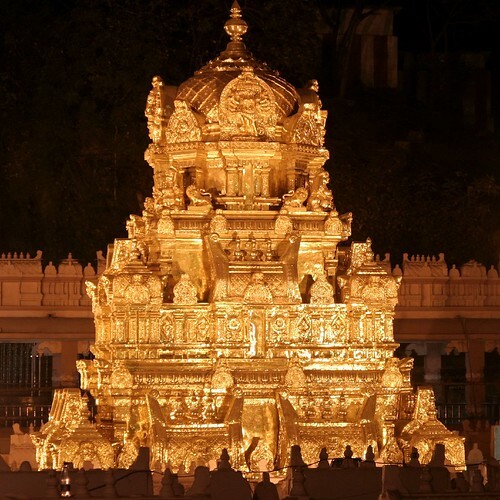 When Madhava Varma shown his impartiality by punishing his son with death, there rained gold on Vijayawada and both the boys were blessed to live again. In yet another incident Malleswara stood by one of his staunch devotees Sripathi Pandithaiah, who believed there was no other God by Malleswara; and his stubbornness made the people ostracize him and he was even refused fire. The enraged Pandithaiah sought the blessings of Malleswara and cursed the people that they would not get fire any more, for he had taken possession of it, packed it in a silk cloth and hung it on a branch of a Sami Vriksham. The people had to apologise to Pandithaiah at the instance of their King, to get back the fire. The nine-day festival of Navarathri ends on Vijaya Dasami Day when people worship arms and perform ayudha Pooja. Local chieftains used to celebrate the festival with pomp. Once a police officer refused them permission to display their arms on Vijaya Dasami day. He got a cable from that he was dismissed from service following many complaints against him. Terrified by the events, the Officer not only permitted the people to celebrate Vijaya Dasami but also took part in it. Later he got another cable canceling his dismissal order. Thenceforth, it became a tradition for policemen to celebrate Vijaya Dasami, which is still in vogue. Kanaka Durga is specially decorated as Balatripura Sundari, Gayathri Annapoorna. Mahalakshmi, Saraswathi, Lalitha Tripura Sundari, Durga Devi, Mahissura Mardini and Raja Rajeswari Devi on each day of the Narvarathri festival. On Vijaya Dasami day, the deities are taken in a swan-shaped boat around the Krishna river, popularity known as "Theppotsavam". Though a ghat road was laid in 1969, most of the pilgrims prefer to climb the steps leading to the temple an arduons task for women and children. Some devotees climb the hill, decorating the steps with turmeric powder and vermilion to redeem their pledge of Metla Pooja. The number of pilgrims visiting the temple has been ever increasing and its present annual income is touching Forty Crores. A second prakara Mandapam is constructed with first floor on the North and West, besides under taking several other works for beautification and public convenience. For the first time in the living memory "Sathachandiyagam" was performed in the temple from 28-12-1987 to 2-1-1988, for the benefit of mankind, as also to protect them from all evils. VIJAYAWADA is practically the centre of Andhra in all its aspects. It is an important junction in the Madras-Calcutta, Madras - Delhi routes, and probably the foremost town of Andhra. It contains three ancient temples viz., the Kanakadurga temple, the Malleswaraswamy temple and the Vijayeswaraswami temple. These are the three temples of Vijayawada. Vijayawada is known in mythology as Vijayavata, and is mentioned in some inscriptions as Rajendracholapura also. it is a famous place of pilgrimage on the river Krishna, and 'has a temple dedicated to Lord Siva in his aspect of Malleswara or Jayasena. Sage Agasthya is said to have been the greatest devotee of this deity and admirer of the deity's several leelas.The origin or installation of Kanaka - durga Devi at Vijayawada is unknown. She is said to be Swayambu or selfmanifest. She also takes the aspect of Chandi or destroyer of the demon Durgama who was causing havoc among the peace - loving inhabitants of Dakshinapatha. Mallikarjuna or the Malleswara as he is known in the Puranas is said to have been installed by Yudhishthira, the eldest of the Pancha Pandavas, as a token of their victory of the South. Thribhuvana Malla, Western Chalukya King of the 10th century A.D, historically constructed the temple.The installation of Vijayeswara is said to have been done by Arjuna, one of the Pancha Pandavas, to commemorate his victory with Lord Siva in the shape of Kirata or hunter. The place Vijayawada is surrounded by many hillocks and the most important of them is Seethanagaram, while the less important is called the Kanakadurga or Kanaka konda. On the southern side of the Kanakadurga temple, is a hillock with sculptures bearing inscriptions, indicating the names of Gods and Goddesses cut below them. Most of these figures are forms of the Goddess in her aspect of Durga, which are dealt with in the Mantra Sastras. Traditionally these hills were originally continuous and at the commandof the Lord, they got separated, making enough space for the river Krishna to pass through. During their wanderings in the forest, the Pancha Pandavas came to Darukavana, where Vedavyasa met them, and told them that one of them should perform Tapascharya in praise of Lord Siva, and obtain from him, the Pasupatastra as a boon, so that they may easily conquer their enemies. Arjuna was chosen for this task and be betook himself to the top of the Indrakila hill (which is said to be the same as the Indrakila hill of Vijayawada) and was performing intense Tapascharya, with his arms upraised, and standing on one foot, and surrounded by the Pancha Agnis or five fires, with four artificial fires around him, and the fifth being the Sun God himself above him. Being pleased with the great Tapascharya of Arjuna, Lord Siva wanted to further test his sincerity, before granting him the desired boon, and therefore took the form of a Kirata or hunter. Parvati also dressed herself as a huntress and the Sivagana of the Lord also came in several disguises. Accompanied by all these, Lord Siva was hunting on the Indrakila bill, driving a wild boar in front of him. The wild boar came to the side of Arjuna, and Arjuna being a great warrior, took up his bow, and shot it with a single arrow. At the same time, Lord Siva who was following it also shot it with an arrow, and being struck by both the arrows, the boar fell down dead in the middle. Both the Lord and Arjuna claimed the boar as their kill, and a -controversy arose between them, as to whom the boar should belong. Words led to physical quarrel shortly, and the Lord and Arjuna began to wrestle with each other. An experienced and powerful wrestler though he was, Arjuna was no match before the Lord himself, and was soon exhausted. Even in the midst of that desperate struggle, he never lost his one-pointedness of mind and devotion to the Lord. To invoke divine aid in his favor, he made a Shivalinga out of the earth, worshipped it, and offered prayers to it. He saw the flowers, with which he worshipped the Linga, as physically falling on the hunter before him and he thereupon realised that the hunter was none other than the Lord himself. The hunter immediately disappeared and the Lord appeared himself before Arjuna, in all his glory. Arjuna prayed to him and his prayer was granted, and Pasupatha was given to him by Lord Siva, As a commemoration of this great event, Arjuna is supposed to have installed the Vijayeswara temple here, in the Indrakila hill. In the Indrakila there are several rock-cut temples. These were supposed originally to be ancient temples, but during the course of time, they were completely buried under debris. When quarrying for stone and road metal was done, they were revealed, and the rock-out temples were preserved as protected monuments. There is in the temple an excellent stone sculpture, which contains in all its four faces the story of Kiratarjuneeyam. There are interesting legends about the origin of the Malleswaraswamy temple also. It is stated that, prior to the Kaliyuga, the sage Agasthya had named the Lord at Vijayawada as Jayasena.The Mahabharata hero Arjuna, who was a great wrestler or Mallayoddha, called the Lord as Malleswara. The thus famous Lord Siva so goes the legend, graces with his presence and blesses the town Vijayawada on the banks of the sacred Krishna River. There is another legend about this in which it is stated that in the Kaliyuga, as early as Saka year 117, there was a king famous on earth by name Madhava Varma. The son, of this Icing once killed by accident the child of a woman who eked her livelihood by selling the fruits of tamarind trees (Intrini-Jeevini). The king, who meted out justice according to the principles of Dharma, sentenced his own son to be banged, in order to uphold the principles of justice. Pleased at this impartial attitude and the adherence to principles of Dharma, of this king, God Malleswara came down and showered gold on him, which brought back to life the deceased prince and the dead child. Thus the great Lord Malleswara. Established in this world, the name of the great King Madhava Varma. Later on a pious devotee by name Panditharadhya came here, and proclaimed to the world that the devotees of Lord Siva were superior even to the sages. He illustrated the truth of this, by bundling up live, coal in a piece of cloth, with the tender twig of a Sami tree, without burning it. God Malleswara was pleased with it and manifested himself to this devotee. This Lord according to the popular legend, is Mahadeva Malleswara, "the endless one ' the lover of his devotees and worshipping whom the lords of the earth prospered of old". There is an inscription in the temple, of the 9th century A.D., in the usual Telugu script. The inscription is strangely recorded from bottom upwards. Its purport is to say that a certain Thrikoti Boyi or Trikoti Boyu, the son of Kaliyama-Boy of Pechchevada, set up the pillar as a commemoration of his own fame, in order to secure distinction for his race. The Thrikoti Boyi is identified in the inscription with a Guhyaka Yaksha, who in Dwaparayuga was directed by Indra to direct Arjuna to Indrakila hill, where Arjuna should worship the Lord Siva in order to obtain Pasupatha from him. Besides being a religious centre, Vijayawada is also the very centre of Andhra culture. The Chalukyas of Kalyani once conquered this place, and the famous Chinese Huin. Tsang had visited this place in 639 A.D. when Buddhism was at its zenith. Vijayawada that is a famous centre of Andhra thus enshrines three important and ancient temples and the temple of Kanakadurga is especially a sacred and powerful one, which attracts a large number of pilgrims even now.